Take advantage of our shores at any time of day. 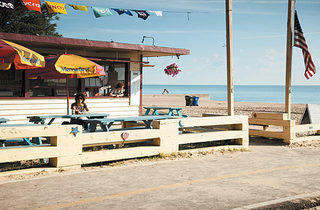 Here’s an invigorating wake-up plan that’s more fun than a cold shower: Head to the beach-front outpost of famed Rogers Park eatery Heartland Café to try its new breakfast offerings—including pastries, yogurt, fresh fruit and lattes—then check in with Kayak Chicago at the north end of the beach for a relaxing morning paddle (630-336-7245). Watch the sun rise over the lake, reflecting off downtown skyscrapers as you reel in bass, trout and perch in the quiet morning hours. The breathtaking views of the skyline, museums, lake and park will remind you why you suffer through grueling Chicago winters year after year. In spring and fall, the peninsula becomes one of the best salmon fishing spots around. Beach breezes or musty gym? You tell us which is more likely to get you out of bed in the morning. Trainers from Beachin’ Boot Camp offer workouts in the sand at 6:30am and 7:30am every weekday through September. Sprints, core training and cool-down yoga are part of the regimen (312-823-3403; per month $200, first 100 sign-ups $100, season pass $300). While your coworkers power-walk to the nearest sub shop, knock out a few brisk laps in the designated swim lanes at this downtown beach. On your way back, grab some well-earned barbecue from the beach-front Robinson’s No. 1 Ribs or clean up with a shower at the McDonald’s Cycle Center (chicagobikestation.com; monthly pass $25, annual pass $149) on the Randolph Street side of Millennium Park. For a more low-key break, pack a gourmet picnic basket from Fox & Obel Food Market (401 E Illinois St, 312-410-7301), grab your best office chum and kiss cubicle-land goodbye. Dine to the tune of the surf or over a battle of wits at the park’s chess pavilion. Hop a southbound bus to Burnham Park Skate Park (3400 S Lake Shore Dr) near 31st Street Beach. Let off some steam riding the 20,000-square-foot park’s ramps and rails, then grab a slice at Connie’s Pizza, located right on the beach, for the ride back to Cubeland. The Chicago Area Runners Association (312-666-9836; membership $40, beginner runners’ series $35–$80) offers after-work runs along the lakefront for beginners on Wednesday nights at 6:30pm. Runners meet at Lululemon (900 N Michigan Ave) to get tips from pros on apparel, stretching and nutrition, then head out for a group run along the path. Every Thursday night in summer, Jazzin’ at the Shedd (312-692-3373; $10–$12) brings a different act to the Shedd Aquarium’s breezy terrace while food and drink make the rounds. Speed past rush-hour traffic by taking the lakefront path on a rental bike from Bike Chicago’s Navy Pier location, which stays open until 10pm (888-245-3929, bikechicago.com; $6–$12 per hour). Then, stick around afterward for an evening stroll at nearby 12th Street Beach. 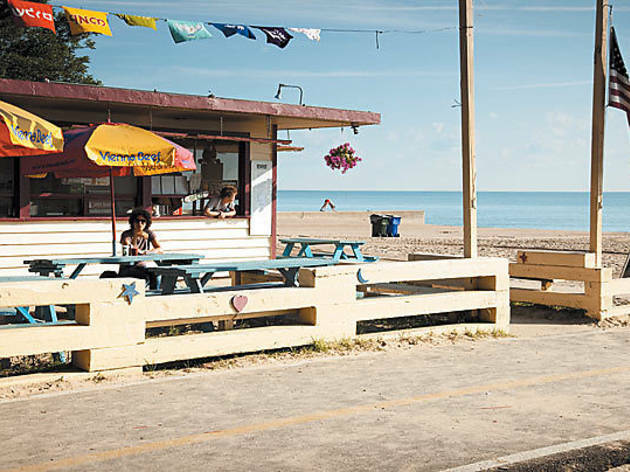 The beach house at North Avenue rents out volleyball equipment (312-742-3224, $5 per set) until 9pm on weekdays—5pm on weekends—which means you can meet your crew for a few after-work matches in the sand. Follow up the fun with a team-building drinking session on Castaways’ beach-front terrace.